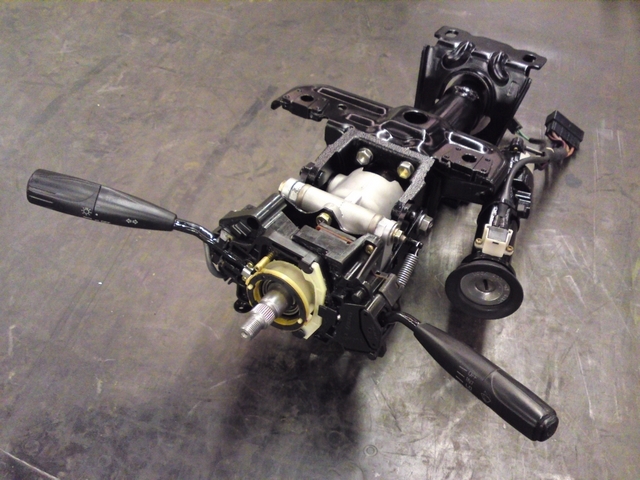 In order to steer the car precisely, the steering installation of the car should be in good condition. So this has all been refurbished as well. My Corolla coupé didn't come with power steering, and I like it that way. My old Corolla hatchback had to do without it too and I didn't miss it for a second. The feedback in the steering wheel is perfect that way and power steering is only really used when parking the car, so I can easily do without. 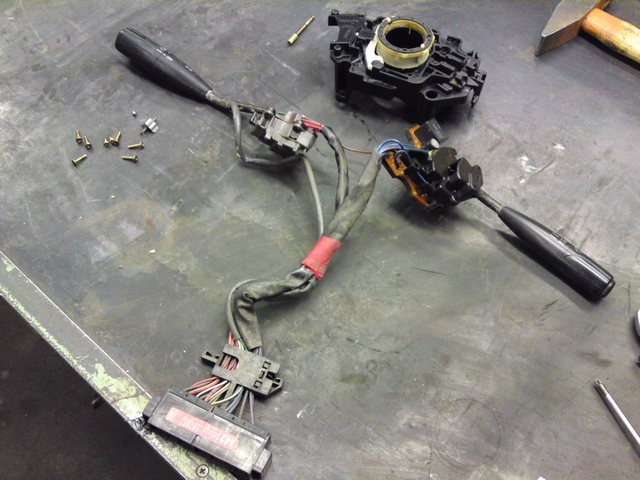 With the rebuild of the steering rack, I didn't really have the chance to make pictures (I forgot my camera), but as always, I started with the disassembly. It proved to be a good decision to refurbish the steering rack as the top bearing was already showing quite some play. So I ordered all new parts to be able to put the the rack back together like new bearing, gators, tie-rods, etc. While a lot of parts were going to be powder coated, I also send the steering rack housing with those parts to be coated in a nice black, making it look like new. Sadly, I don't have any pictures of the new parts and the rebuild of the steering rack. It is probably the only time I had forgotten to take my camera with me. 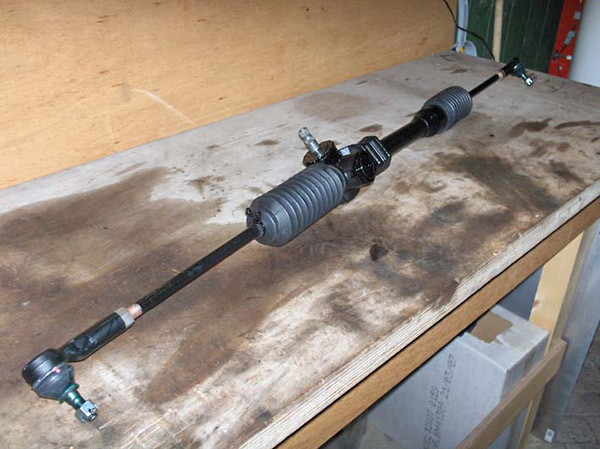 The fully refurbished steering rack. 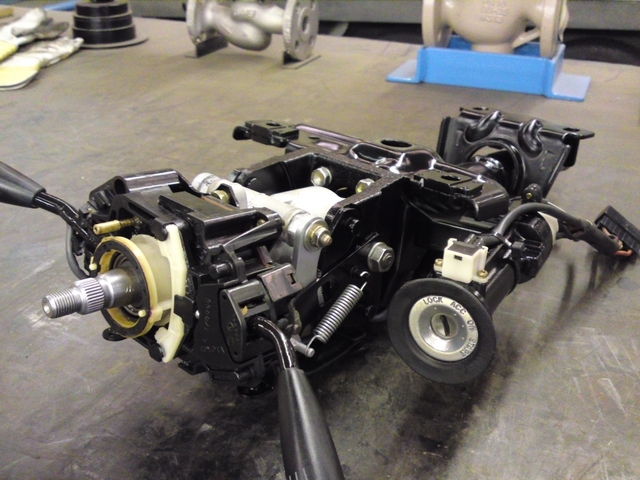 But there is steering column between the steering wheel and the steering rack. That was one of those bare metal parts that came from the interior and ended up rusting a bit in my old workshop. So that would need a little sandblasting and a coat of paint. The height of the column is adjustable, so there are a lot of extra parts that other non-adjustable columns don't have. 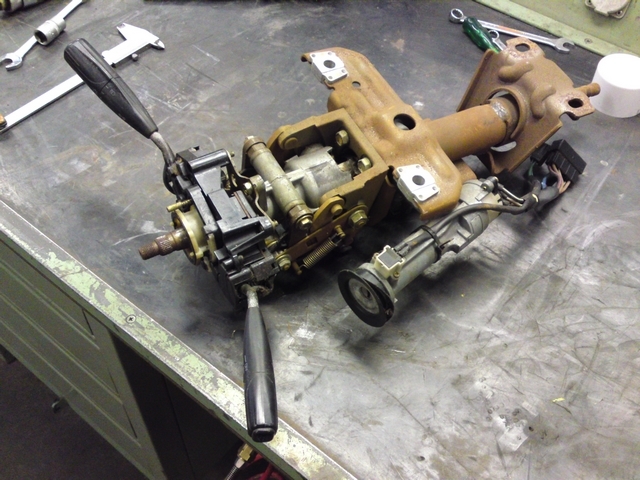 In the picture above, you can see how the steering column looked like after all those months. And although there is nothing really wrong with the column, it just couldn't be installed back into the car looking like that! 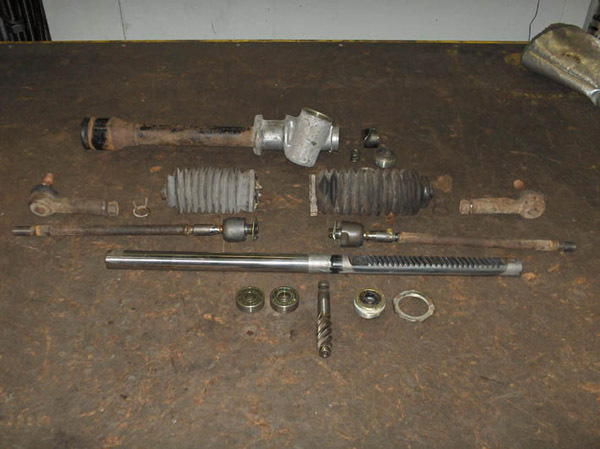 The complete steering column in pieces. 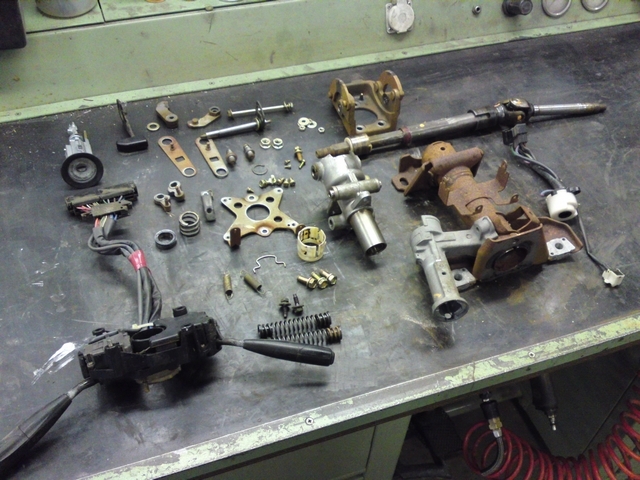 Once I started to disassemble the steering column, there were a lot of parts coming out of it. But all those parts got sandblasted and were painted to prevent it from corroding again. 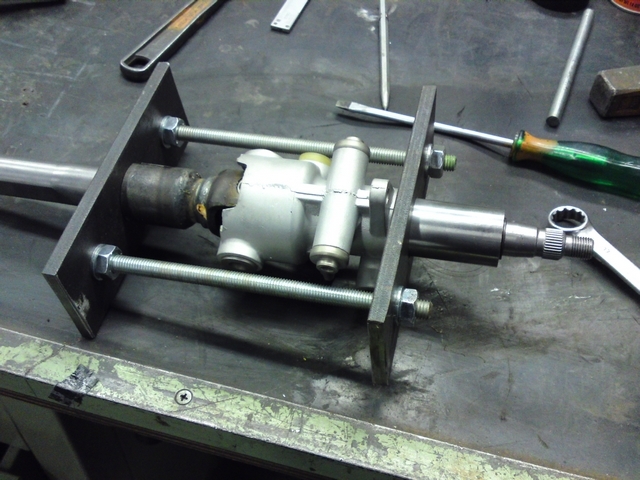 But to be able to put it all back together again, I had to make a little tools to compress the spring that holds the steering axle in place. I drilled a few holes in two thick plates and with was able to compress the strong spring enough to put the retaining ring back in place. While all the parts were hanging to dry the paint, I also took a closer look at the part with the stalks for operating the wipers and lights. I gave it a good clean and a lick of grease where necessary. The only thing missing on this steering column was a wiper stalk with a interval setting. The orginal switches that are on there now only have 3 settings: Slow, continues wiping and fast. My old Corolla hatchback had this as well and sometimes I really got fed up with the wipers being to fast or to slow for the amount of rain falling on the windscreen. With mild rain, the slow setting was already to fast and I would just let the wipers do one cycle by hand. But that gets annoying quite fast. The solution to this is the interval switch. I had this switch in my Carina E GTi and my current Avensis has one too. And it can really take a small irritation away while driving in the rain. There were Corolla's that had these interval switches, but I had the added problem of having pop-up headlights and I needed the settings of the switch in the lighting stalk for that. So I couldn't just use any stalk assembly from a other Corolla. But I ran into a Celica T18 in the junkyard. This has pop-up headlights too and this particular Celica also had an interval switch on its stalk. So I took that with me to compare it with the stalk assembly on my car. 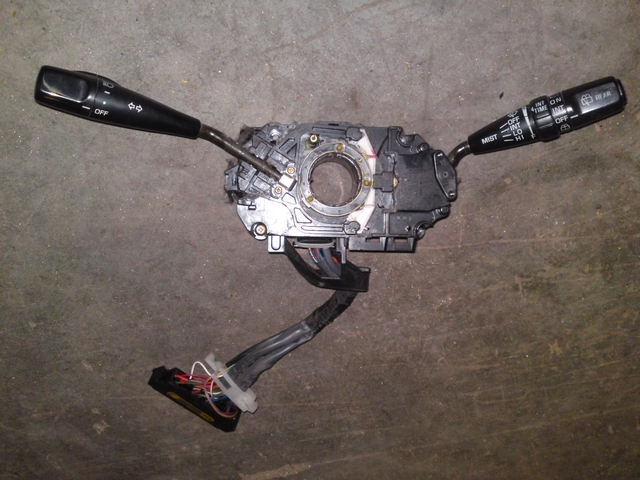 And after comparing them I think I should be able to use this complete assembly in the Corolla. They are pretty much the same and even the connector is plug and play. I might have to rearrange a few wires, but that shouldn't be a problem.